The most important of those is to always look closely at the trace file (or chromatogram) of the sequencing results you get back from your favorite sequencing facility. 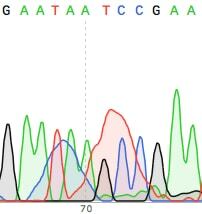 When you run a restriction digest on a gel you always include proper controls like uncut DNA and the proper ladder. These controls help you properly visualize your results. 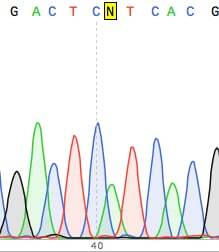 Here is an example of a seemingly clean DNA sequence (no Ns in sight). If you never looked at the trace you would be happy. 3. Expect to get 500-700 bases of clean reliable DNA sequence. I hope these tips will help you get the most out of your DNA sequencing verification and to troubleshoot any problems that come up. 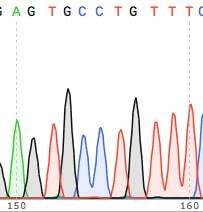 Good luck analyzing your sequences! Try Ugene (free ware) the one and only best software. And 30 days trial sequencher will help you out to remove ambiguous sequences. Google the names and you will find the links to download. I can recommend ApE (A plasmid editor) for anything related to DNA sequence management. It can also open .ab1-files. Only alignments are not as sophistcated as with professional/commercial software like SeqMan (Lasergene suite, DNASTAR), this one is my favourite actually, but very costly – we just happen to have it at our lab and it’s very convenient. 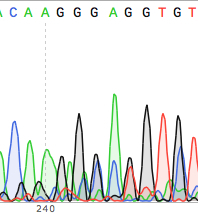 BioEdit can also view .ab1 files, it has a load of other sequence alignment tools as an added bonus, and its free. And remove any primer sequence, since this not necessarily reflects the actual sequence.